This beautiful walnut pedestal desk is English-made by hand as a Georgian period reproduction. The walnut boasts a rich complexion, enhanced by hand-finished surfaces and complemented by lovely cross banding and antiqued escutcheons and solid-brass pulls, which are an elegant swan-neck style. The rich, creamy leather, a stunning black, complements the walnut beautifully and features graceful hand-worked gold tooling and embossing around the edges. The sides and knee hole feature shaped paneling, and the finished back features beautiful paneling and a stunning display of the walnut grain. This pedestal desk also comes with a removable modesty panel and rests on gorgeous ogee bracket feet, whose embellished beauty give the desk a sense of completion. With three drawers, a file drawer, a computer cabinet and a keyboard drawer–all of which lock with accompanying keys–this pedestal desk offers an impressive amount of storage space. The moderate size of the desk–at six by three feet–and beautiful finished back mean that placement is easy, and because of the incredible amount of storage, you get the most use out of minimal space and size. This desk also disassembles for storage and shipping into the desktop and two pedestals, so there is no need to worry about moving the entire desk at once. The knee hole measures 26? wide at its widest, 23? between the feet, and is 25.25? tall. 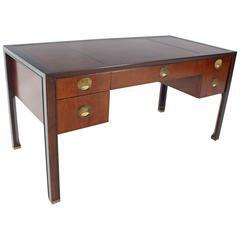 Mid-Century Modern teak walnut case leather top executive desk with brass pulls. Heavy solid brass feet tips. This is possibly Finn Juhl design desk. 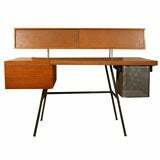 This desk was designed by George Nelson for Herman Miller.